DHEA is the body’s most abundant circulating hormone, but as we age DHEA levels begin to decline. Supplementing for healthy DHEA levels can help support immune function, circulatory health, mood and well-being, healthy body weight and lean muscle mass, libido, and more. Peak blood levels of DHEA occur at approximately age 25, decreasing progressively thereafter.1 Maintaining healthy, youthful serum levels of DHEA has a variety of health benfits.1-4 Thousands of studies have been published on DHEA’s various benefits, including immunomodulatory properties as well as positive effects on mood, quality of life, and body composition. Rejuvenating the circulating levels of DHEA to those found in young people may improve overall well-being and sexual function as well. 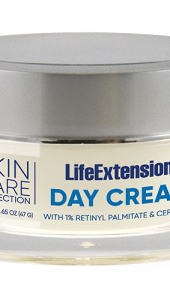 Life Extension’s DHEA directions for use are specially drafted to provide safe, optimal dosing. Regular blood testing is highly recommended both for dosage accuracy and blood level monitoring. 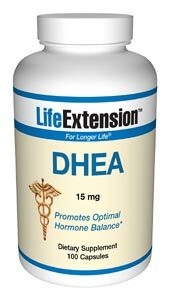 Because of the overwhelming evidence connecting low levels of DHEA to age-related factors, Life Extension suggests that all people over age 40 begin DHEA supplementation. For most people, the starting dose of DHEA is between 15?75 mg, taken in one daily dose. 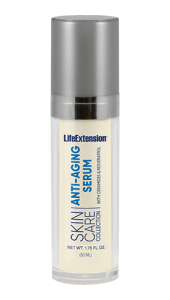 People over age 40 who do not supplement with DHEA usually have serum levels below 200 ?g/dL, and many are below 100 ?g/dL since an age-related decline generally takes place after the third decade in life.1,16 This product contains 15 mg of DHEA per capsule. Men with prostate cancer or severe benign prostate disease are advised to avoid DHEA since it can be converted into testosterone (and estrogen). Therefore, men are advised to have a PSA and digital rectal exam before initiating DHEA to rule out existing prostate disease. It is important for men over 40 to have a physician check their PSA and DHEA-S serum levels every six to twelve months. Men should also periodically check their blood levels for free testosterone and estrogen to make sure that DHEA is following a youthful metabolic pathway. Women should consider estrogen and testosterone testing when they take their DHEA blood test in order to evaluate DHEA’s effect on their blood levels of these hormones. Women who have been diagnosed with an estrogen-dependent cancer should consult their physicians before beginning the DHEA restoration process. Other ingredients: microcrystalline cellulose, gelatin, silica. 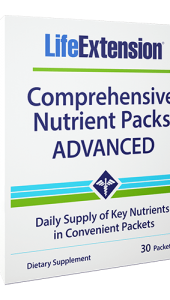 The exact number of capsules to be taken should be determined by blood testing and the advice of a physician. Generally, take one (1) to three (3) capsules in the morning only. DHEA serum blood tests are suggested 3 to 6 weeks after initiating DHEA replacement therapy to optimize individual dosing.